Cousin Gary RV is proud to be a supplier of Zamp Solar, the #1 in Mobile Solar Solutions! Now you can get a permanently mounted solar RV kit which will give you the freedom to run everyday appliances and devices with total confidence! Zamp Solar has the largest RV Solar selection in the industry. 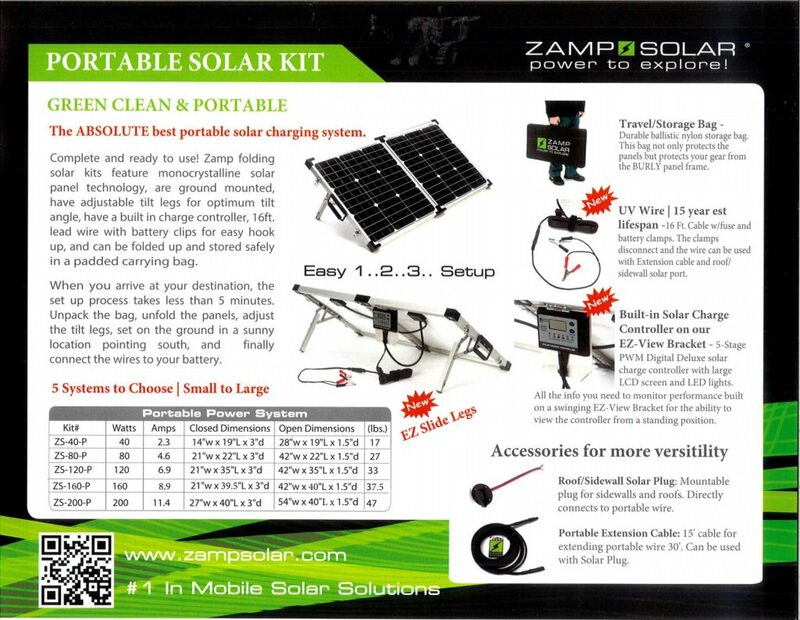 If you are concerned about keeping your batteries charged, Zamp Solar has the charging system you need that will save you money. In addition, Cousin Gary RV can provide you with a portable solar kit! It comes complete and ready to use! The set up process takes less than 5 minutes. Just unpack the bag, unfold the panels, adjust the tilt legs, and set on the ground in a sunny location pointing south. Lastly, connect the wires to your battery. Simple and easy! Enjoy Electrical Independence with a Zamp Solar System! Clean, Green and Quiet! Call Cousin Gary RV or drop by to find the best solar solution for your RV and take it to the road!